Don't Be Scared of Moving Costs: Be Informed! Don&apos;t Be Scared of Moving Costs: Be Informed! Any major life event can cause a little anxiety, but for some people, it can quickly spiral out of control. Will my priceless treasures be broken during the move? Will something be mislaid, and I&apos;ll never find it again? What about the cost -- will I be able to afford to do everything I need to do with my home after the move or will unexpected expenses eat through my budget? The good news is that while there are always costs that you can&apos;t account for, if you&apos;re able to nail down the major expenses there should be little need to be scared of going way over budget for your next move. There are always good, honest people in the world, and if you&apos;re fortunate, you will deal with them during your move. Unfortunately, there are a few businesses and individuals who do not have your best interests at heart, so it is important to get all estimates or contracted services detailed in writing and agreed upon by both parties. Quoting over the internet is perfectly acceptable for services such as providing car insurance, but movers should come to your home to check out what you&apos;ve got before providing an estimate for moving your household goods. Knowing that you&apos;ll be in constant control of your prized possessions can go a long way towards alleviating the fear of a move. With Zippy Shell, you&apos;ll always be the only person with access to your items that are in storage because you&apos;ll have the only key! The peace of mind that this simple fact brings cannot be overstated. You know that when you place your items carefully in our street-legal storage pods, that everything will be exactly where you placed it before locking the doors. Climate-controlled facilities ensure that household items are protected just as they would be in your home. Managing costs during a move is important, and anywhere you can cut costs is welcome! 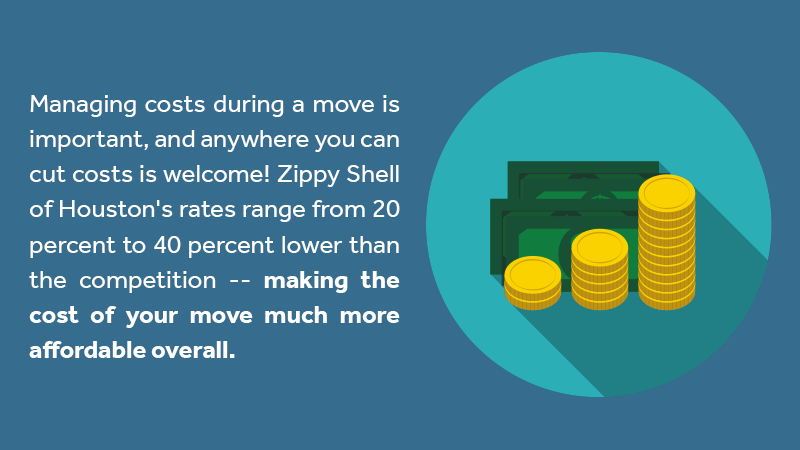 Zippy Shell of Houston&apos;s rates range from 20 percent to 40 percent lower than the competition -- making the cost of your move much more affordable overall. While other costs are variable, the cost of storing your valuable furniture and goods can be easily found by using Zippy Shell&apos;s online quoting tool. Even if you&apos;re exhausted from a move, you&apos;ll sleep better in your new home knowing that your important items are being safely stored and are waiting for you when you need them. Whether you&apos;re actively moving or just need a little extra residential or commercial storage, contact Zippy Shell Houston today at 832-464-7174. Our friendly service associates will be happy to answer your questions or provide you with a free estimate for all of your storage needs.